Dr. Jiang has 9 years of industrial experience before he joined NC State in 2009. At the graduate level, Dr. Jiang teaches micro-transducers incorporated with smart materials and micro/nanostructures (MAE 532). At the undergraduate level he teaches Solid Mechanics (MAE 314), Strength of Mechanical Components (MAE 316) Principles of Automatic Control (MAE 435), and Non-destructive Testing and Evaluation (MAE 440, with lab modules). 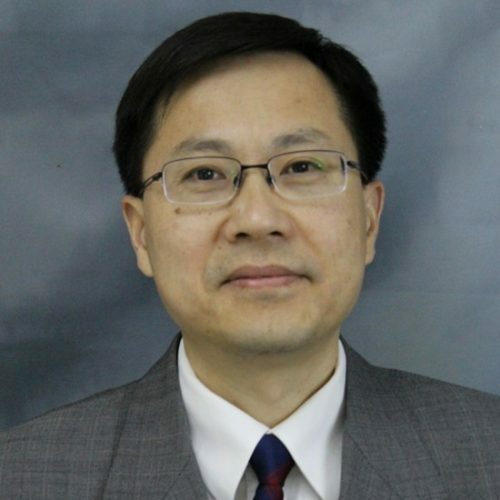 As a faculty advisor, Dr. Jiang looks for hard-working students who have a strong background in physics and acoustics and who are interested in developing strong instrumentation skills. His research is attractive to students who are interested in cutting-edge research in the biomedical, mechanical or aerospace areas, and who are interested in advanced imaging and therapy methods and techniques. Jiang is interested in micro/nano-sensors, actuators and transducers and their applications in biomedical and aerospace engineering; ultrasound imaging for medical and industrial NDE/NDT applications; high power ultrasound therapy; sensors and actuators for extreme environment; and micro/nanofabrications with smart materials and structures incorporation. Presently, he is 1) conducting research in high-frequency and broadband ultrasound transducers for biomedical imaging, therapy and NDE, 2) developing electromechanical devices for extreme environments, and 3) studying new smart materials and micro/nanostructures for energy conversion (harvesting, sensing, actuation). Small aperture intravascular ultrasound transducers will be prototyped for thrombolysis applications. In-vitro thrombolysis tests will be conducted to confirm the effectiveness of the developed transducers. Poling induced domain structures play a significant role in relaxor-PT piezoelectric single crystals. In this project, AC poling technology and the associated single crystal domain structures will be studied for novel acoustic sensors. We will develop low cost sensor arrays that can be attached to an ultrasound probe and collect real-time position, orientation, force (between probe and maternal abdomen) and the probe temperature data that is synchronized with the sonograms. Once developed these sensors will be adopted into a clinical algorithm and this additional data collected on all ultrasound scans. The proposed sensor system can be used for automatic ultrasound scan for medical imaging. In this project, a forward-viewing catheter delivered microbubble assisted sonothrombolysis system will be developed for rapid and effective treatment of deep vein thrombus. Intravascular transducers will be designed, fabricated and characterized, followed by in-vitro, ex-vivo and in-vivo thrombolysis tests. In this project, a novel ultrasound sensor array will be developed for imaging applications. In this project, we will develop high temperature (> 600 C) embedded/integrated sensors (HiTEIS) for wireless monitoring of reactor and fuel cycle systems. HT pressure sensors, vibration sensors and liquid level sensors will be designed, fabricated, embedded and characterized, followed by nuclear structure integration and evaluations. The proposed technique will likely be used to enhance the safety and efficiency of nuclear power systems. Atherosclerosis is the leading cause of morbidity and mortality in Western countries, in large part due to plaque rupture. Vulnerable plaques are the most likely to rupture, being the major cause of acute myocardial infarction and sudden cardiac death. Neovascularization of the arterial walls by adventitial vasa vasorum appears to participate in the progression of atherosclerosis and atherosclerotic plaque neovascularization was shown to be one of the strongest predictors of future cardiovascular events. No techniques are currently available for the quantitative assessment of vulnerable plaque, which remains an unmet need. Microbubbles are extremely powerful contrast agents for ultrasonic imaging of the vasculature and Contrast Enhanced IntraVascular UltraSound (CE-IVUS) seems to be one of the most promising imaging modalities for the detection of atherosclerosis and vulnerable plaque. However, although this technique allows the detection of the vasa vasorum, CE-IVUS currently does not provide a quantitative characterization of its micro-architecture. The specificity of CE-IVUS has to be improved. A quantitative assessment of the vasa vasorum network in vivo would strongly predict cardiovascular events yet no such techniques currently exist. We propose using ultrasound multiple scattering to characterize the microstructural properties of neovascular networks. By using ultrasound multiple scattering to characterize the architecture of the neovascularization, we will add a new dimension to CE-IVUS. With the technique we propose to develop here, CE-IVUS will not only be used for the detection of plaque related neo-angiogenesis, but also for its characterization. This will dramatically increase the specificity of CE-IVUS for the assessment of plaque vulnerability. It will enable the ultrasonic assessment of the vasa vasorum to become a widely used clinical tool for screening, diagnosis and monitoring of plaque vulnerability. Sponsor: Electric Power Research Institute, Inc.
High temperature non-destructive evaluation (NDE) sensors are important in NDE of structures in high temperature environments. In this project, HT NDE sensors will be characterized at specified temperature ranges, and the sensitivity and stability of these sensors will be determined for power plant NDE applications. In this project, a special shear mode piezoelectric transducer will be designed and analyzed. Unlike the conventional ultrasound transducers with cables, the proposed laser ultrasound is wireless and capable of unprecedentedly remote delivery of ultrasound energy for drug delivery, therapy, and health monitoring of biological and industrial structures. The specific goal of the proposed work is to investigate the carbon nanofiber composites and the associated laser-ultrasound patch (LUP) for ultrasound generation and detections. Specific tasks include: 1) laser ultrasound transduction mechanism study and the LUP transducer design; 2) Fabrication of carbon nanofibers (CNF) with desired optical, thermal and elastic properties and CNF/polymer composite fabrication; 3) CNF characterization, CNF/polymer composite characterization and LUP acoustic characterization; 4) Laser ultrasound tests for drug delivery, thrombolysis, and non-destructive evaluation. This is a truly multidisciplinary research, preliminary data collected under this project will strengthen our future proposals on using laser ultrasound for minimal invasive surgery, drug delivery and wearable electronics to NSF, NIH, DOE and DOD.